Taiji has at its primary aim the cultivation of the Tao, or the practice of enlightenment, and has evolved into a set of soft slow movements, co-ordinating with the concentration of the mind and the breath. The internal organs are gently massaged, and the blood, sinews and bones are strengthened. The pathways in the body are opened. After a time the Chi (vital energy) will be felt accumulating and begin to circulate throughout the body. Further practice refines this Chi and the (Shen) spirit may begin to manifest. Training of the Yi or mind leads to a deeper understanding of the body/mind, mind/body integration. 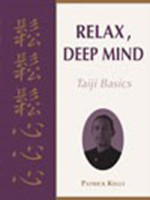 Relaxation is the basis of tai-chi, leading to naturalness and harmony in life. Usually as people grow older, their muscles and joints stiffen, while their inner energy decreases. The exercises of taichi were carefully designed and refined over hundreds of years to counter the effects of age and further, to create a surplus of energy in the body ensuring physical and psychological health, and supporting spiritual growth. Tension, related to physical and psychological problems, and many conditions of ill health may also improve or be completely cured as the inner energy accumulates. People of all ages and states of health are equally able to practise Tai Chi. It requires only an attitude of genuine inquiry, patience and perseverance.